The Gracie Queen is for quilters who desire stability without sacrificing the traditional beauty of a wood crafted frame. It is our largest frame yet and can be set up in three sizes. It has height adjustable legs allowing you work at your ideal level, a fourth rail to keep your batting off the floor, and even a flip up rail so you can easily examine and adjust the batting under your top quilt layer. 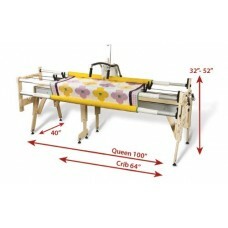 Adjust your frame from crib (64”), to queen (100”). The 3 sturdy aluminum rails and precision ratchets make it easy to handle your fabric and tension without basting! Flip up the bottom rail to quickly see and adjust your batting and backing layers. Height adjustable legs are standard on both the Gracie Queen and the Gracie King, letting you work at the level that is most comfortable to you. The Fabri-Fast™ slots and tubing make attaching your fabric easy, without the use of tacks, ties, or tape! Grace Quilt CAD Software Program for Quilting Template Patterns Included!